Fractional calculus, in allowing integrals and derivatives of any positive order (the term fractional is kept only for historical reasons), can be considered a branch of mathematical physics that deals with integro-differential equations, where integrals are of convolution type and exhibit mainly singular kernels of power law or logarithm type. It is a subject that has gained considerably popularity and importance in the past few decades in diverse fields of science and engineering. 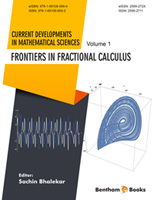 The purpose of this book is to establish a collection of articles that reflect some mathematical and conceptual developments in the field of fractional calculus and explore the scope for applications in applied sciences. The book is divided in 4 sections as follows where the authors are outlined. I congratulate with the Editor, PhD Sachin Bhalekar who was able to collect so a variety of topics of which the reader can evaluate the relevance. Fractional Calculus is very popular subject among the Mathematicians and Applied Scientists. The nonlocal operators in fractional calculus provided challenging research topics for Mathematicians. On the other hand, the applied scientists found these operators more useful than classical integer order ones. It is indeed a happy moment to present this book which contains eleven chapters on different aspects of Fractional Calculus. The first part of this book contains three chapters on Fractional Diffusion Equations. In Chapter 1, Zhang and Deng discussed the solutions of fractional diffusion equations using wavelet methods. Maximum principle for time fractional diffusion equations is proposed by Luchko and Yamamoto in Chapter 2. The Chapter 3, by Hristov is about the nonlinear sub-diffusion equations. The second part Analysis contains four chapters. The shifted Jacobi polynomials are used by Ganesh Priya, Muthukumar and Balasubramaniam in Chapter 4 to analyze the solution and system identification of coupled fractional delay differential equations. In Chapter 5, Kucche presented the monotone iteration principle in the theory of Hadamard fractional delay differential equations. Bhalekar, in Chapter 6 analyzed the dynamics of fractional order modified Bhalekar-Gejji System. Cioc analyzed the Grunwald-Letnikov derivatives in Chapter 7. Third part of this book is Computational Techniques. It contains the chapter 8 by the research group: P. Patil, N. Singhaniya, C. Jage, V. Vyawahare, M. Patil and P S V Nataraj. They presented the GPU computing of special mathematical functions used in fractional calculus. The last part of the book is Review which contains three chapters. Daftardar-Gejji and Kumar presented a review on the popular iterative method NIM in chapter 9. A review on fractional derivative with non-singular kernels is taken by Hristov in Chapter 10. Some open problems in fractional order nonlinear system are discussed by Bhalekar in Chapter 11. I am very thankful to all the contributors of this book for their valuable work. The foreword for this book is written by Prof. Fransesco Mainardi. I am indebted to him for his guidance and support. Mr. Omer Shafi of Bentham Science Publishers helped me in the publication process. I am thankful to the Bentham Science for publishing this book. I wish that the book will provide the readers a basic knowledge, introduce higher topics and present applications of this subject.